I have 2 younger sisters in Japan. We are three girls growing up surrounded by mom’s home cooking and handmade items. It’s been our dream to have an exhibition together to show our work in public to share our favorite things to do in our busy lives. 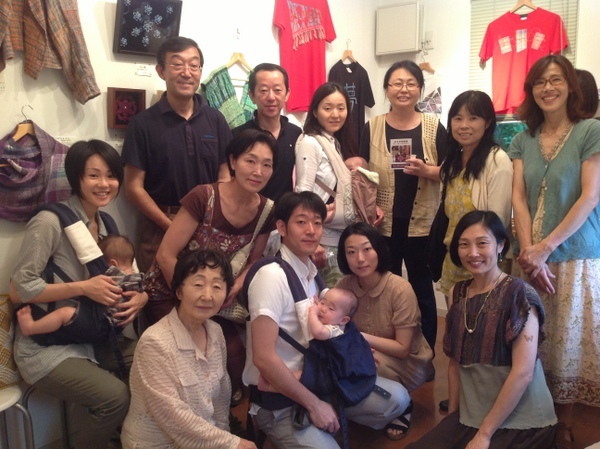 The very first exhibition had taken place in Yokohama for four days at the end of July. Yokohama is a big city near Tokyo where we grew up and my youngest sister and my mom still live. My middle sister, Chiho went to a cooking school after she had worked for a business company for five years. Baking became her specialty. She had worked at a famous bakery for a while. 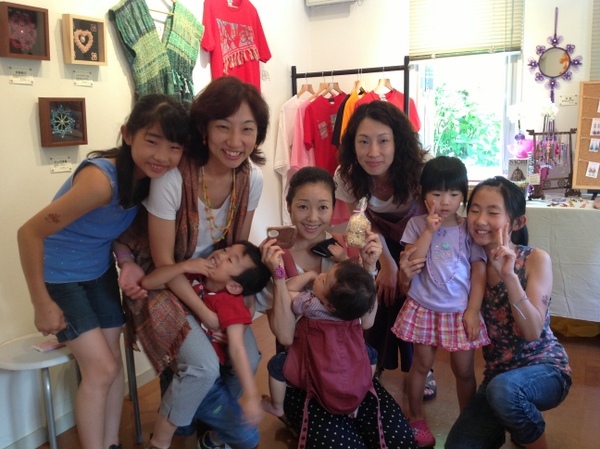 Now she lives in Sapporo, Hokkaido which is the north island of Japan with her husband and three children. She has been involved in early education while she has been baking cakes for a cafe once in a week. She uses safe ingredients such as wheat, eggs, and sugar from local farm. My youngest sister, Maho has been knitting since she was 9 years old. She had worked at a craft shop for a while. Later in her life she was interested in traditional Chinese Knotting and got certified in Taiwan. 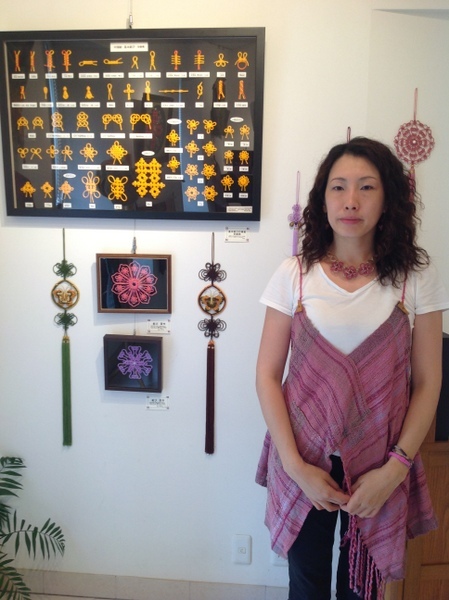 Recently she has been teaching Chinese knotting at a local community center to mothers who have small children and teaches elderly people as well. 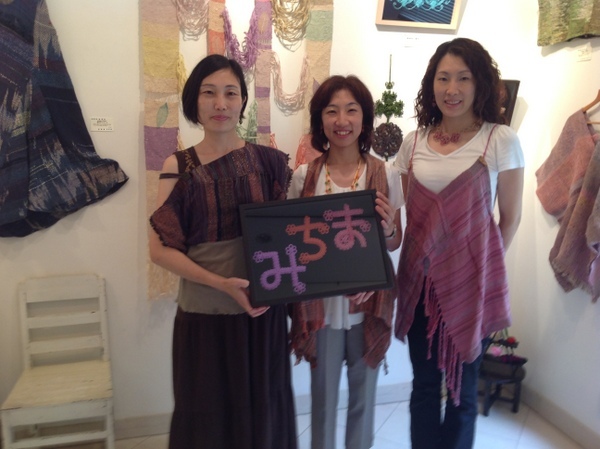 The name of the exhibition MiChiMa is from first sound of our names. We were used to be called “MiChiMa sisters” by friends’ families so they could remember our names in order. We rented a small gallery which was a perfect size for us. Fortunately during these four days many of our old and new friends visited us. Three of us and our mom barely had time to have a bite for lunch in a tiny kitchen taking turns. There were some people I had not met for 30 years! My dad’s co-workers, our friends from elementary school, middle school, high school, our co-workers, friends from neighbors, daghter’s kindergarten and so on. We were all busy with catching up each other’ s lives, talking about our memories, showing and explaining our work. Poor Chiho had to bake cakes every nights after supper for next day’s show although she had prepared (frozen) as much as possible. 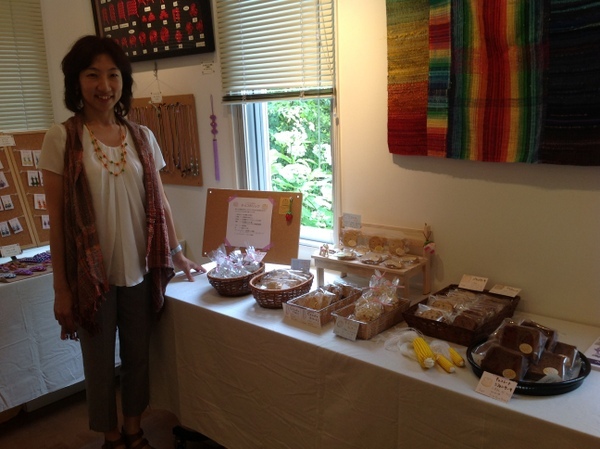 However, it was a huge success because we had many visitors and sold many work. Unexpectedly many people told us that the show gave them good energy and made them think what they would like to do in their lives. My three nieces had helped us in their way. Our mom must have been so proud of her daughters. What we realized was that her and our dad (passed away more than 20 years ago.) did always let us do whatever we wanted to do. They were always encouraging us. They never forced us do anything and didn’t say what we should do. That’s why we were allowed to explore what we were interested in all these years. I am so grateful for that. And I hoped this show was not just for us to show our work but also a wonderful opportunity for many people to get together and had a great time. Oh, I had made a tunic and a vest for my sisters. Those are extra work I did for this show but it was worth it! I have two sisters also so it is easy to understand how marvelous this was for all of you, Thank you so much for sharing this joyful experience with us.